A consortium comprising South Korean construction companies Samsung C&T, Doosan and Hanhwa Construction has been awarded a contract to build units 5 and 6 of the Shin Kori nuclear power plant. Both APR1400 units should be in operation by 2022. Korea Hydro and Nuclear Power (KHNP) announced yesterday that it had awarded the KRW 1.18 trillion ($1.06 billion) contract following a tender process. 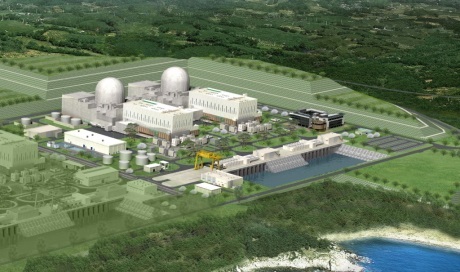 Construction of Shin Kori 5 is scheduled to begin in September 2016, with that of unit 6 set to start one year later. Unit 5 is due to enter commercial operation in March 2021 and unit 6 in March 2022. The Shin Kori site currently hosts two OPR-1000 reactors (units 1 and 2), which began operating in 2011 and 2012, respectively. Two APR1400 have already been built at the site (units 3 and 4). Shin Kori 3 had originally been due to begin operating at the end of 2013, with unit 4 following in September 2014. However, with their operation already delayed by the need to test the cabling, the units are now expected to start up in July 2015 and May 2016, respectively. KHNP noted that it plans to issue a tender for the construction of units 3 and 4 of the Shin Hanul plant during the second half of 2016. Shin Hanul units 3 and 4 will also be APR1400s. Construction of these will start in 2018, with both units expected to be operating by 2023.